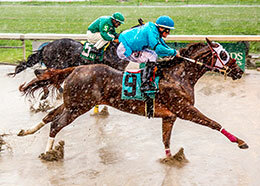 Roster Man with Juan Marquez aboard splashes home in the De Saix Stakes at Fair Grounds Race Course & Slots Saturday afternoon. Jr.
NEW ORLEANS, LA—SEPTEMBER 8, 2018—Roster Man earned his first stakes victory at the Fair Grounds in the $25,000 De Saix Stakes on Saturday afternoon. Final time for the 300-yard race was 15.401, with a 95 speed index for the gate to wire winner. A full field entered for the 2-year-old stakes race, which gave preference to horses with highest lifetime earnings in lieu of qualifying time trials. It was the second career win for Roster Man ($11.00) and yet another win for the current leading jockey of the Fair Grounds fall Quarter Horse meet, John Hamilton. The 2-year-old son of first-crop sire Five Bar Cartel had previously qualified for the $700,000 Lee Berwick Memorial Futurity but finished well off the board. He now has two wins in six starts and $48,800 in earnings. Roster Man is trained by Orlando Orozco and is owned by Luis Armando Castellanos. The colt was bred in Louisiana by Harris Rs Inc and Robicheaux Ranch, out of the Mr Jess Perry mare Jessy Jane. There was no catching Roster Man in the De Saix, but Heza Battmann and Luis Vivanco closed well to place second, a half-length behind the winner. Heza Battmann was two for four entering Saturday’s stake, with all of his four previous career efforts at Delta Downs. Heza Battman is trained by Miguel Rodriguez for owner Jagger Horse Racing. The gelding was bred by B. Randle, K. Williams and L. Osborne in Louisiana, by Heza Fast Dash and out of Deltalicious B, by Teton Forest. A gap of two lengths separated the two frontrunners from third place finisher Mps Triple Zazoom, with Antonio Alberto aboard for trainer Guadalupe Garza, Jr.
Mps Triple Zazoom is a Triple Vodka filly, bred in Louisiana by her owners, Mamou Prairie Stables. She is out of the Shazoom mare Zazoom. She has won two of her five lifetime starts and qualified for the $283,715 LQHBA Lassie Stakes (RG2) at Delta in May. Completing the field were Mia Jet In, Jess Run Corona, Tdz Louisiana Toast, Rollin Bye, Cartel Majic and Piloto Ovation. Parti Wagon was scratched.